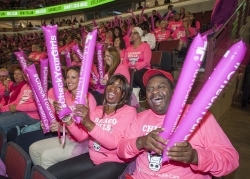 Breast cancer survivors, fighters and family members from across Illinois flanked by physicians and breast health navigators involved in their care along helped #PinkOut the United Center as part of Advocate Health Care and the Chicago Bulls’ efforts to promote Breast Cancer Awareness month at tonight’s game. 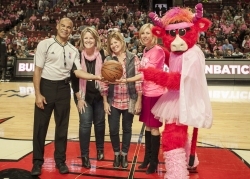 This is the fourth consecutive year that Advocate and the Bulls have honored those affected by breast cancer, a disease that approximately one in eight women develop during their lifetime. Fans entering the stadium received a pink Advocate breast cancer t-shirt. 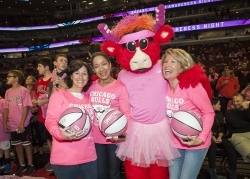 Bulls ambassadors, broadcasters, coaches and members of Bulls Entertainment incorporated pink into their wardrobes, as did Benny the Bull and the Luvabulls. 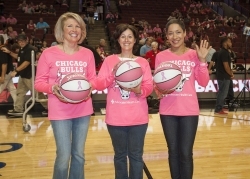 All Bulls players wore special #CheckYourGirls pink shoot around apparel, and the United Center and Advocate Center incorporated pink lighting elements and signage.